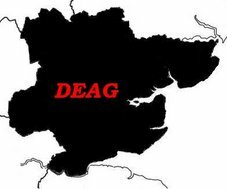 The July meeting of the DEAG took place yesterday and saw a full house, literally, in attendance. Ten DEAG members where joined by Peter Townsend from the Kent and Essex Group to hear a talk on DCC for small scales by Howard Watkins (2mm Assoc. member and MERG Secretary - Model Electronic Railway Group). 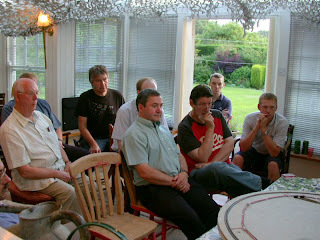 Prior to this our host Melvyn laid on an excellent buffet and drinks. Thanks for that Melvyn. 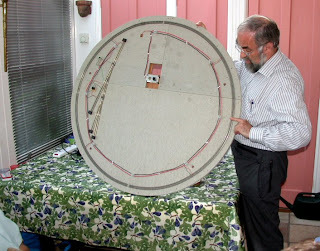 Howard then gave a demonstration of analogue verses digital control on his test track and described the merits of each system. 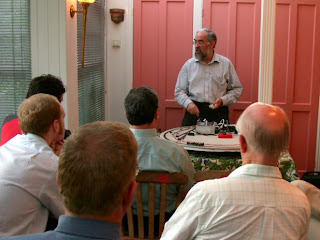 One convincing demonstration of DCC that Howard gave was running a (banking) loco up the rear of a moving train, matching speeds and then slowing and reversing away from the still moving train. Because DCC uses constant voltage at the track, slow running and convincing coach / locmotive lighting can be achieved. 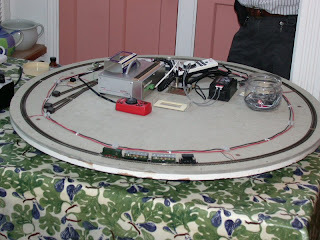 Howard also demonstrated DCC controlled sound both on board the model train and on the baseboard. Throughout the talk lively discussion / questions ensued. The knowledge level of the group varied from complete ignorance of all matters DCC (me) to users of the system with some experience under their belts. Anyone interested in finding out more should check out the MERG website or Digitrains. A Google search on ‘Digital Command Control’ will find links to lots of useful information. There are a number of egroups available where discussion takes place if that is your fortệ. A big thank you to Howard for taking the time to explain DCC to us. Our next meeting will take place on 23 August 2007 when we will revert to cake eating and individual modelling round the table. Anyone wishing to join in should use the contact information in the Yearbook to make contact. Disclaimer: Please note that neither the DEAG, nor the author of this posting can be held responsible for the contents of any quoted links. Potential users of DCC should satisfy themselves of the correctness of the advice given. All information is given in good faith.